The range of the Giant Waxy Tree Frog is South America: the Sipaliwini savannah of southern Surinam near the border with Brazil. The Giant Waxy Tree Frogs inhabit drier forest islands within the Rain forest near smaller streams. Giant Waxy Tree Frogs lay eggs which hatch into tadpoles in about 18 days. They change into frogs 10 to 12 weeks later through metamorphosis. 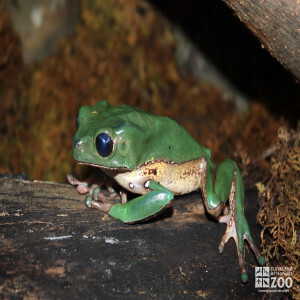 Giant Waxy Tree Frogs are active during the day, foraging in the leaf litter for their food. They move in short hops and are rarely still for more than a few moments. These frogs are solitary except for fighting and breeding. They are territorial, and will settle territorial disputes by having "wrestling matches".